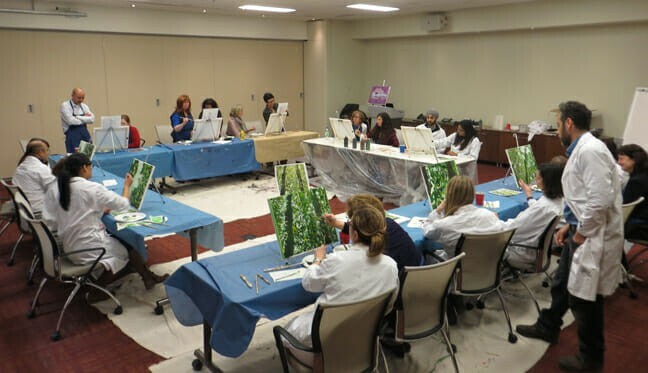 Both instructor and assistant(s) alike will be moving around the room looking for people who need some help with their paintings. Initially everyone starts out with only large brushes as they block in the basic shapes. 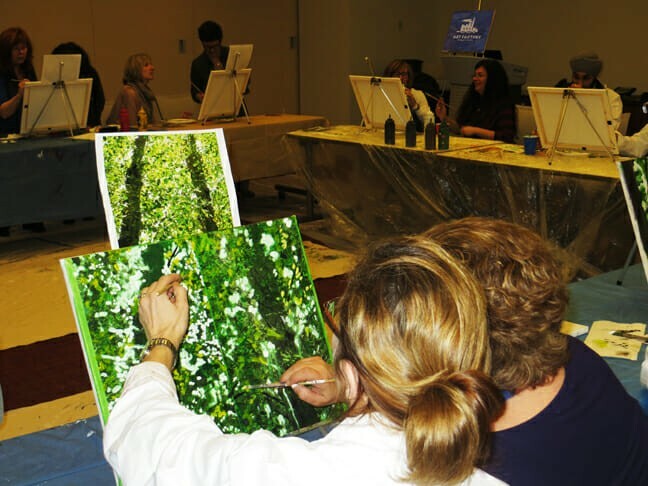 After the first hour smaller brushes are handed out for detail work ( this is an opportunity for people to change canvases where they work on the details of a canvas already started to add a greater interactive sense to the activity). By now all the canvases have been completed and are dry to the touch. 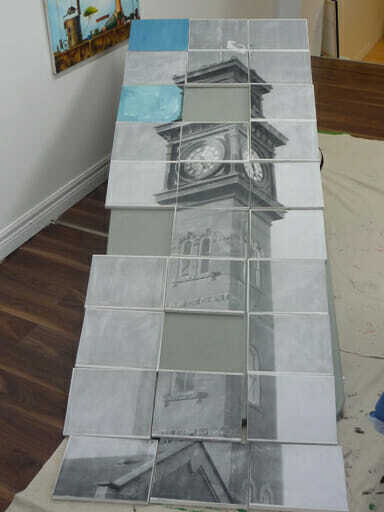 Using velcro we then attach the canvases together, one column at a time, so the finished mural can be held up and photographed with all the participants behind it. This is a great opportunity for sharing on social media or just "family pics" to be shared internally. At this point all the participants have turned in their aprons and brushes, the drop sheets are off the floor and the room is back to how it originally looked before our mobile art studio set up shop! All that remains are memories and a plastic storage container(s) that is keeping protected the big work of art in it's respective canvas pieces. 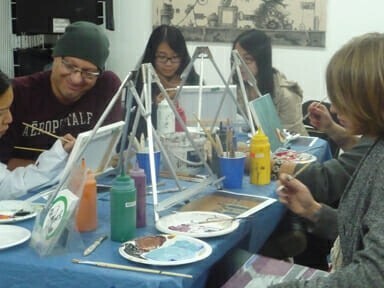 Because we edit and simplify photos to be used as the foundation for the drawing portion of the painting participants get to jump right into painting. Plus, since the image is greatly enlarged and small details eliminated, the image is that much easier to paint. When you step back perspective takes care of the rest and the image comes into view! This ads an extra visual punch for the narrative aspect of the activity as it underlines the importance of stepping back from your problems hoping to experience exactly that kind of clarity. How far will we go to please our clients? About 20 miles ( from the downtown core ). But! We will go beyond that and meet at the destination of your choice at a reasonable cost ( $50/ instructor and $30 for each assistant ). What can people take home with them? The group takes home the massive mural. Individuals don’t take anything home but photos and smiles. What’s nice is that this is exactly the sort of thing which they can tweet about and pass on with social media both expanding your brand and framing it in the best light. How large is the finished work? 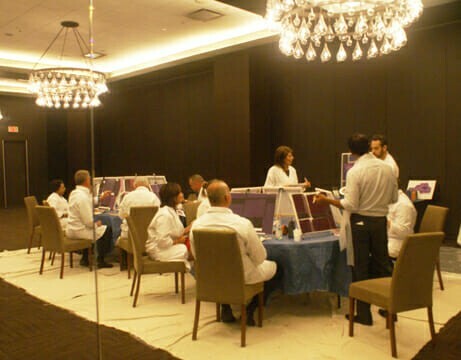 All participants are given a 15×20 inch canvas that can be either hung in portrait ( vertical wise ) or landscape ( horizontal ). Just nine of them can be arranged in a 60″x48″ (5’x4′)! It is for this reason some clients have opted to have multiple work completed at no additional charge ( but extra photos do have to be submitted). All canvases come with either double sided foam tape on the back to stick to walls or wires for hanging the individual pieces. If you would like someone from the Art Factory to install the work for you a charge of $45/hour is applied. Although no solution is fool-proof we have yet to run into a situation that couldn’t be quickly cleaned up. Not only is everyone given their choice of lab coat or apron but the Art Factory always shows up with drop sheets for your floors too! All the paint we use is acrylic and so water soluble ( as long as it doesn’t dry ). The art event takes up 2 hours of time plus an additional 45 minutes to set up and 30 to tear down at the end. 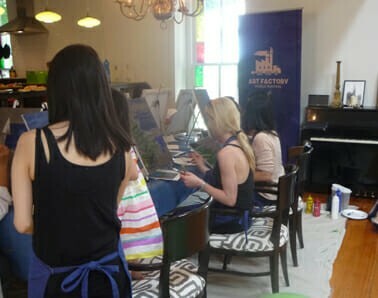 The Art Factory brings aprons, dropsheets, all the art supplies and table top easels for the participants. What we need to already be present are tables for our easels and seats if you intend on having everyone seated for the duration ( advisable !). The team building event comes not only with a custom project for you to paint but plastic tubs where the dry works will be stored until you get them back to the office. 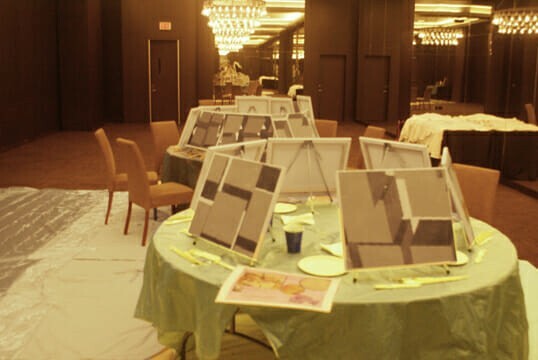 Your team members can paint their heart out but sometimes the work just wouldn’t look right unless one hand brings the pieces together, improving what was necessary and saving as much of the original as possible. 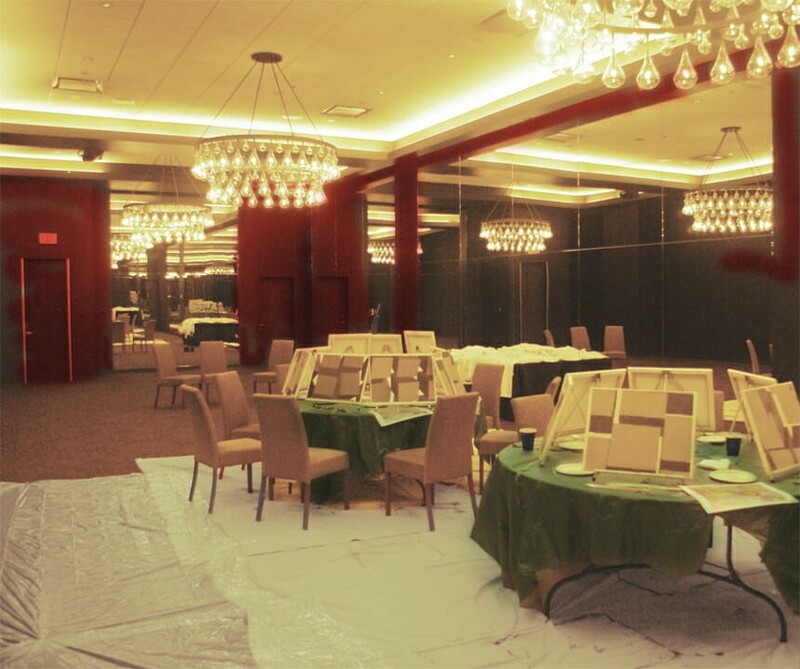 For an extra charge of $60/hour your work can be “touched up” by one of our professional painters – we won’t tell! Just because you have an odd number of people doesn’t mean you can’t create. 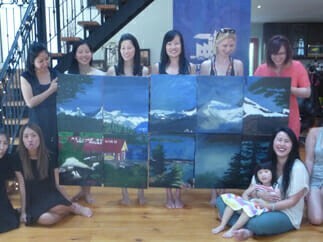 Most photos have “empty” sections for canvases that we’ll prepare for you just to fill in any holes in your group. Choose the image you want, we’ll figure out the rest later! 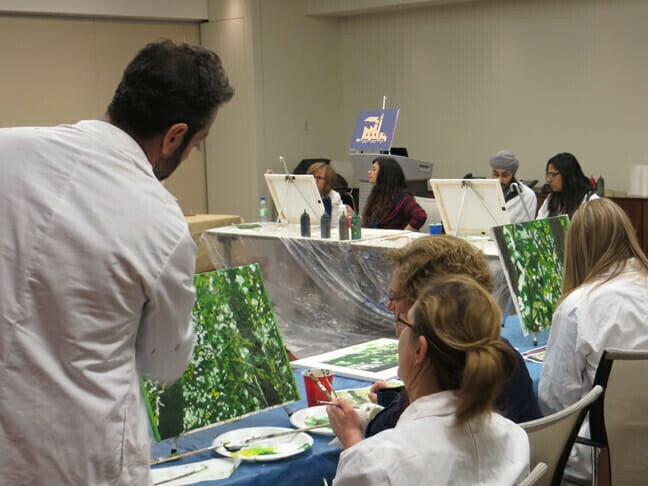 The Business Development Bank of Canada (BDC) recently did a lunch time art project with Eric Budovitch and his team at the Art Factory as a teambuilding exercise for about 70 of our professional employees. The goal of the project was to break up the full day conference with an exercise that got people moving, creating, talking, collaborating and trusting each other in a fun relaxed atmosphere. The team canvases we made did just that. Feedback via a survey after the conference was that an overwhelming number of employees truly enjoyed the project. The bonus to this project, unlike other team exercises, is we now have several finished pieces of art to display in our offices. His team was professional, articulate in explaining the project, and was well prepared with all the supplies required. Overall a great teambuilding project that I would highly recommend for any size group. 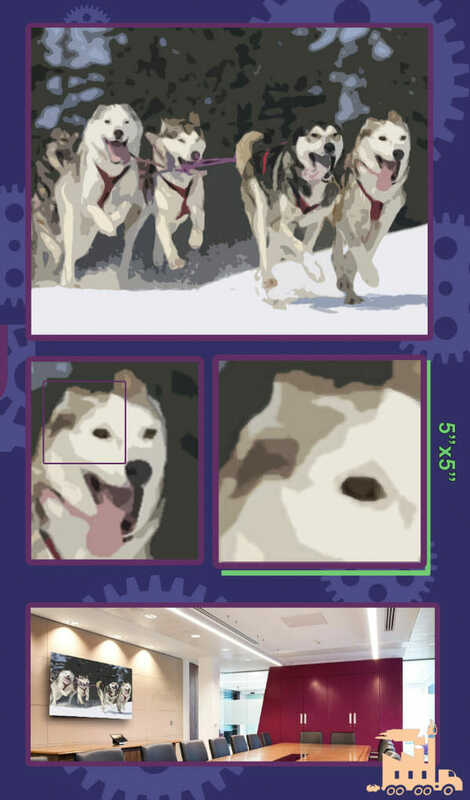 Complex images are simplified into cut-out like designs so amateur artists can successfully complete work significantly above their skill level. Yeah, a little. However artists have always used all the tools at their disposal. We have new tools today. We’ll use them too! What’s important is that this process will give your participants a great deal of satisfaction when they walk away from a work that looks well done. 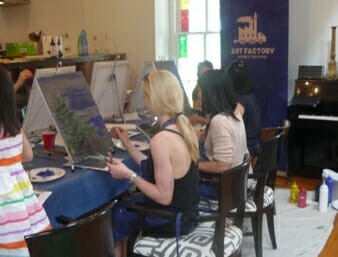 The act of painting, coming from a contemplative and even meditative place, will aid in taking everyone out of their daily routine and giving them a creative act to accomplish from start to finish in a limited amount of time. We're here to help plan your event and make it the one everyone will remember!